Are you breaking the law by asking salary history information? State and local governments are increasingly adopting laws and regulations that prohibit employers from requesting applicant salary history information. There are currently 12 state-wide and 10 local salary bans. While most laws are aimed at ending the cycle of pay discrimination, some regulations go further than merely banning pay history questions. A few of the new laws prohibit an employer from relying on an applicant’s salary history to set compensation if discovered or volunteered. Others prohibit an employer from taking disciplinary action against employees who discuss pay with coworkers. Map of salary bans by state. Click here to view larger map. Not shown: Puerto Rico which enacted a commonwealth-wide ban on asking salary history questions. *In addition to statewide bans, cities and counties in California, New York and Pennsylvania have enacted or proposed their own regulations. 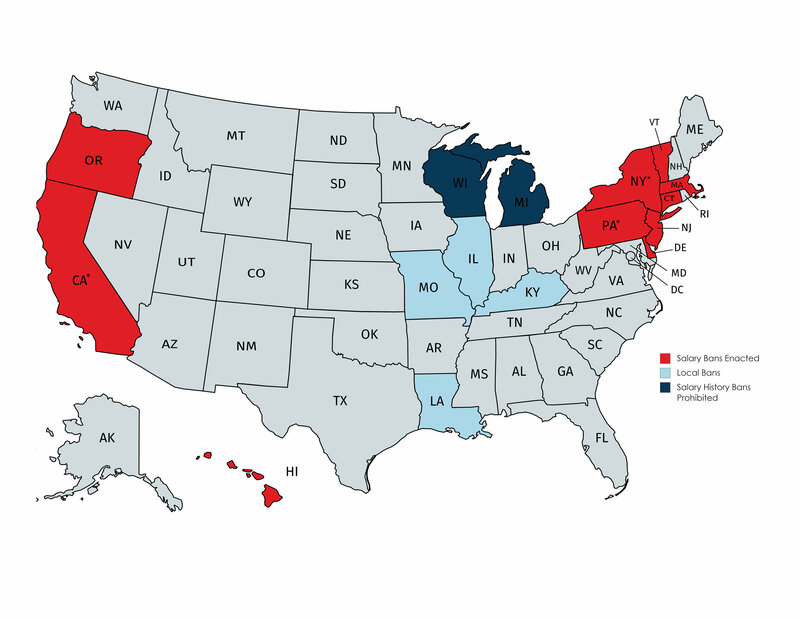 Two states, Wisconsin and Michigan, have prohibited salary history bans. Details can be found at HRDive.com, Salary.com or via the State Rules Register. We recommend that you review your policies when you speak with applicants and your practices when performing past employment verifications. The State Rules Register – located on the homepage of your ordering screen – is available to you to review state and local prohibitions. Another source is Salary.com. While asking for salary is not something AmericanChecked can control or police, we want you to be aware of these new laws to discuss with your legal counsel if needed. If you do not have legal counsel or this is not their area of expertise, we are happy to refer you to an employment law expert.